Don’t confuse narrative and descriptive writing. It happens all the time. I ask a student to write a description and instead he tells me a story. I get it – it’s uncommon to see descriptive writing in isolation. Most of the description we read comes as an integrated part of narrative writing, and it feels uncomfortable for students to describe without giving the description meaning in the context of a story. 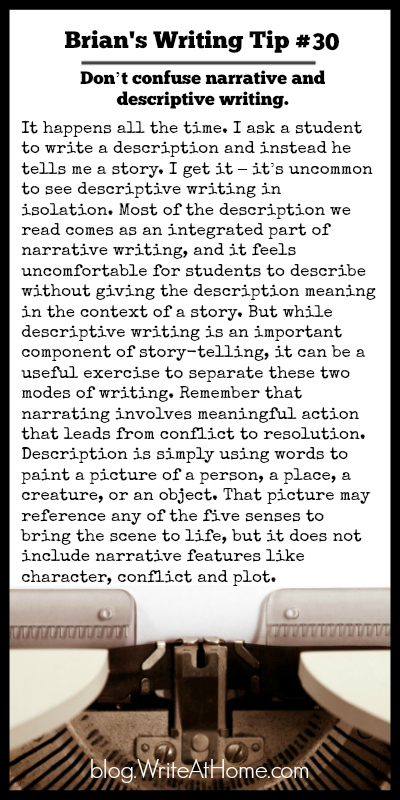 But while descriptive writing is an important component of story-telling, it can be a useful exercise to separate these two modes of writing. Remember that narrating involves meaningful action that leads from conflict to resolution. Description is simply using words to paint a picture of a person, a place, a creature, or an object. That picture may reference any of the five senses to bring the scene to life, but it does not include narrative features like character, conflict and plot. Your comments are always welcome. Leave them in the space below.